For the second time in as many years, representatives of Veteran’s groups, Save Our Armory Committee, and concerned citizens are formally requesting to meet with the City Council and the Mayor. A new vision for the Echo Bay area that includes taking advantage of an adaptive re-use of the historical structure will be presented for consideration. With time running out on the extension of the Memorandum of Understanding (MOU) handed to Forest City/Ratner Developers, proponents of Armory re-use contend that now is the time to rethink the possibilities. At the heart of the new vision is the expectation to return the Armory to its original purpose of serving the public good. To that end, the Armory supporters will be requesting a one year MOU with New Rochelle for the purpose of establishing financing and development services. After the first extension of the MOU, Forest City presented a plan that was not well received by council for its greatly scaled back vision and lack of commitment from the developer to pursue the development of the entire 26 acres that comprise the Echo Bay waterfront. Subsequently a 60 day extension was granted to buy time for the developer to reinforce their position. Allowing the MOU extension to expire would serve the city well in two distinct ways. First it would allow the city to actively entertain alternative plans for the Armory and secondly, it would open up the waterfront acreage to a more competitive climate thereby giving the city new options. The Save our Armory Committee made a presentation to the New Rochelle City Council on July 20, 2010 to describe their plans for a re-adaptive use of the New Rochelle Armory. In a conference room filled with supporters, the demonstration of a vision, and the path to realize the goal of returning the Armory to public service was offered to a reserved, but receptive city council. Speakers including Save Our Armory Committee Co-Chairs Ron Tocci and Peter Parente and SOA Executive Committee members John Verni and John D’Alois. The entire presentation including Q&A ran to about 40 minutes; to meet the requirements of YouTube it is necessary to break the video into four parts. Take a moment to view the presentation and see if you can envision the next chapter in New Rochelle’s history. Part 1 of 4: Introduction and Vision for the Armory, Ron Tocci. Part 2 of 4: Tech & Uses, Peter Parente. Noam Bramson thanks SOA from coming. Barry Fertel asks for copy of Engineering Report. Noam Bramson explains limitations City is under due to Forest City MOU. Noam Bramson suggests that Forest City, Monroe College and Save Our Armory Committee Meet. Chuck Strome explains that Forest City controls all discussions on Armory property and building until December 31, 2010. Noam Bramson asks John Verni if “sources and uses” financial document is available? Council and Staff discusses Forest City’s rights under MOU (edited out due to length issues) after which Noam Bramson explains Next Steps within that context. Richard St. Paul asks what the impact will be on the MOU or RFP from which the MOU was derived if Forest City plan does not include the Armory? Ron Tocci asks whether, if Forest City allows it, SOA can get into the building and make emergency repairs before winter? Technical services and video edits courtesy of Andrew Wasson from Save Our Armory and Bob Cox from Talk of the Sound. Thank you all for your support ! 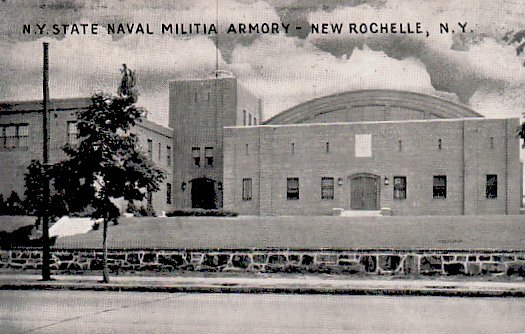 A planned proposal for the adaptive re-use of the New Rochelle Armory will be presented to the New Rochelle City Council on Tuesday, July 20 at 7:00 PM . Executive members of the Save Our Armory Committee, representing Veterans and local supporters of the beleaguered facility, will offer a development plan that includes, opening up access to the water, community services for youth and seniors, veteran support services and open public space with a focus on successful economic growth and environmental sustainability. The meeting will be held in the Council Chamber of City Hall, 515 North Avenue. The public is welcome and encouraged to attend. The meeting can also be viewed on Verizon channel 28, Cablevision channel 75 or online, at www.newrochelleny.com. 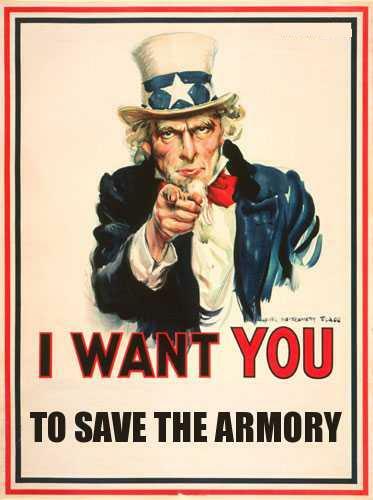 The Save Our Armory Committee is a privately funded volunteer organization dedicated to the preservation and community use of the New Rochelle Armory. As we’ve seen, the call went out to all concerned and the city was stopped in its tracks from its latest ploy to destroy history. Citizens turned out by the score to rail against this latest injustice. Among the speakers were committee members, local radio hosts, activists and citizens like you. Former Assemblyman Tocci gave the latest update regarding the State representatives’ reaction to the news that the Armory issue has NOT been settled. It’s reported that Senator Klein was most surprised that the story painted by the mayor didn’t actually reflect the reality. That within 36 hours of the truth being reported Senator Oppenheimer, Assembly Members Paulin and Latimer all pulled their support for the mayors request. Anger, frustration, and betrayal, were the common theme among the amped up, yet organized crowd. The evening culminated with a review of a privately funded illustration of Armory possibilities. The graphic representations were met with excitement and approval especially in light of the absence of any meaningful contribution from the city. For your enjoyment, here’s a pictorial essay of the nights events. New Rochelle Armory is Calling All Veterans! As a veteran, aren’t you entitled to improved services? Shouldn’t the price you paid be reimbursed with the full backing of a society dedicated to providing the means necessary to address the needs of every veteran? New Rochelle citizens want to provide these much needed services for you and the multitude of young men and women returning from overseas. Our mayor, with his lack of concern for all veterans, is moving to sell out the Armory so he can hand it over to a private developer for private profit. Shouldn’t we have a dedicated, historical tribute to all those who have served and the many who paid the ultimate sacrifice. A dedicated regional source for veterans services to assist anyone who needs it? The Armory is THAT place. Don’t let the mayor sell you down the river along with the broken promises made between New York State and this city. Show yourself at the Legion Hall, Post 8 on Monday, June 28 at 19:00 hrs and let them know the veteran community will not be shrugged off. Join Pete, Ron and the rest of us as we battle for what’s right, for what YOU deserve. 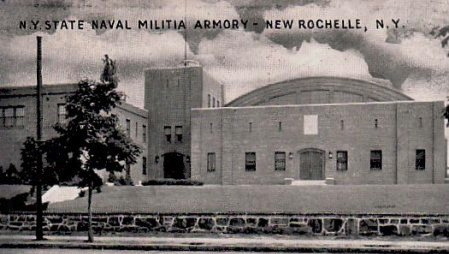 You are currently browsing the archives for the New Rochelle Armory Committee Meetings category.